Post your organization’s conservation professional-level technical training, workshops, webinars and professional development events. 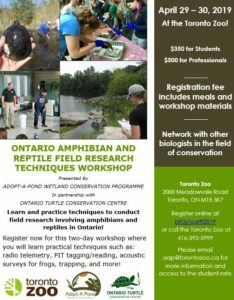 This event listings service is geared towards conservation professionals, interested conservationists, students enrolled in conservation-related programs, and new grads who would register for, travel distances to attend, and perhaps even be posters. Reach other professionals to help them build their skills and knowledge. Employers, conference organizers, please visit your Account Centre or create an account to post events. WorkCabin does not guarantee the accuracy of information contained in such listings, relevance, compliance, legality, decency or suitability of any material, products, services or information. The use of such listings on the Website does not constitute in any manner a reflection on, affiliation with, or endorsement by WorkCabin of any such website or entity or its respective information, products or services. See our full terms and conditions.